Halloween is an exciting time of the year and can be a quite different experience to international students who don’t celebrate it in their home country at all or just in another way. We’re trying to make the Halloween week as much fun as we can by offering several Halloween related events. 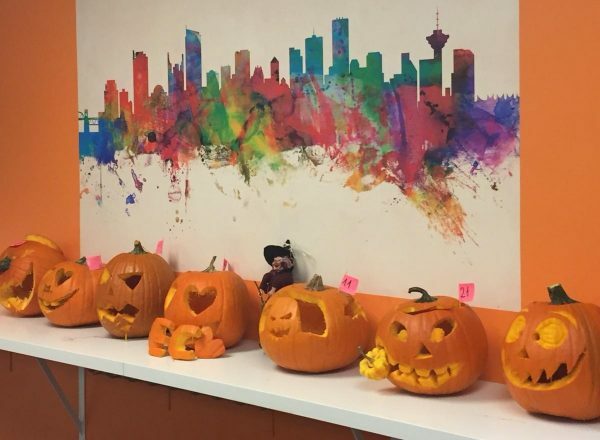 Our annual pumpkin carving event is extremely popular. Only a few of the students have carved a pumpkin before so it’s a new experience to most of them. They are extremely curious about it and excited to get started. First of all, the group has to choose a pumpkin and all the group members have to agree on the choice. The next step is to find a design and to agree on that as well. Once they know how they want their Halloween pumpkin to look like, the students examine their carving tools and get started. They love making a mess and being creative. It is so much fun for everyone. Some already know exactly how they want to design their pumpkin and some just make a plan as they go. This event is great for students’ creativity and team spirit. Last but not least, the group with the best pumpkin can win a nice price which is part of their enormous motivation as well. Another Halloween event is our costume contest. Students dress up as whatever they like and then they get to show their Halloween costumes to the others by presenting them on a catwalk at school. Classmates cheer for each other and the student with the loudest cheer wins. Having the best costume also means winning a great price. And of course the Halloween week comes with a lot of Halloween candy. This week is fun for everyone at school; students, teachers, and staff. English courses in Vancouver will help you to improve your English skills and bring you closer to different cultures and traditions at the same time.